With several new cinnamon-flavored cereals making their debut on crowded shelves nationwide, the question on everyone's mind is "Who will be the last cereal standing?" Begun, the Cinnamon War has. Let's stick a spoon in the new offering from Kellogg's and see how it fares. 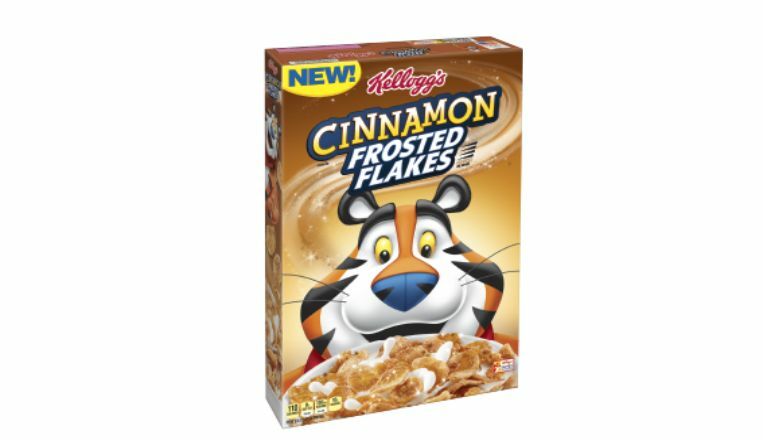 If Kellogg's marketing department can be believed, their new Cinnamon Frosted Flakes cereal is an answer to an outcry from breakfast enthusiasts everywhere. Their advertising department is on record as saying that this cereal is in response to the numerous requests that they've been bombarded with on social media, and that this hallowed box is the culmination of about a year's worth of planning. Furthermore, they went on to state that they've gone through about 100 different recipes to get the cinnamon levels just right and ensure the maximum level of deliciousness in every bite. So with the Kellogg's hype machine in full swing, how does this cereal actually taste? I'm pleased with the particular cinnamon flavor that they've chosen for this cereal. It has a sweetness that almost reminds me of honey, but little of the spice that can also come with the reddish-brown powder of power. It kind of reminds me of the taste of a cinnamon Pop Tart, which makes sense, given that Pop Tarts are also made by Kellogg's. Cinnamon Frosted Flakes have that familiar corn flake crunch which has been a staple of Frosted Flakes for as long as most of us have been born, and the cinnamon complements the corn flakes EXTREMELY well. If you've ever ordered a Fried Ice Cream from a Mexican restaurant, you know that Cinnamon and corn flakes go together like rama lamma lamma--ka dinga da dinga dong, and this cereal does kind of have that fried ice cream taste, especially with the milk. Apparently, Kellogg's released their first attempt at Cinnamon Frosted Flakes about a decade ago with something called "Tony's Cinnamon Krunchers." I have no memory of this cereal whatsoever, so it's not surprising to learn that this first attempt didn't sell and left the shelves with its tiger tail between its legs. Cinnamon Frosted Flakes seems to be the right product at the right time. It's good. Oh yeah. REALLY good. Stay tuned as the Cinnamon War continues with Post's own warning shot to the complacent cereal competition with their own Cinnamon Pebbles. Who will win? In a war this delicious, we all do.